For the company, see Amersham plc. Amersham (/ˈæmərʃəm/) is a market town and civil parish within Chiltern district in Buckinghamshire, England, 27 miles (43 km) north west of London, in the Chiltern Hills. It is part of the London commuter belt. Amersham is also 15 miles (24 km) from Aylesbury and 13 miles (21 km) from High Wycombe. There are two distinct areas: Old Amersham, set in the valley of the River Misbourne, which contains the 13th century parish church of St. Mary's and several old pubs and coaching inns; and Amersham-on-the-Hill, which grew rapidly around the railway station in the early part of the 20th century. Geoffrey de Mandeville holds Amersham. It answers for 7 1⁄2 hides. Land for 16 ploughs; in lordship 2 hides; 3 ploughs there. 14 villagers with 4 smallholders have 9 ploughs; a further 4 possible. 7 slaves; meadow for 16 ploughs; woodland 400 pigs. The total value is and was £9; before 1066 £16. Queen Edith held this manor. Queen Edith was the wife of Edward the Confessor and sister of king Harold, and after her death in 1075 the land passed to William the Conqueror who granted it to Geoffrey de Mandeville. In 1200 Geoffrey, Earl of Essex obtained a charter for Amersham allowing him to hold a Friday market and a fair on 7 and 8 September. In 1613, another charter was granted to Edward, Earl of Bedford, changing the market day to Tuesday, and establishing a statute fair on 19 September. In 1521, seven Lollard dissenters (William Tylsworth, John Scrivener, Thomas Barnard, James Morden, Robert Rave, Thomas Holmes and Joan Norman) were burned at the stake in Amersham. A memorial to them was built in 1931 and is inscribed as follows: "In the shallow of depression at a spot 100 yards left of this monument seven Protestants, six men and one woman were burned to death at the stake. They died for the principles of religious liberty, for the right to read and interpret the Holy Scriptures and to worship God according to their consciences as revealed through God's Holy Word". The Universal Magazine of September 1749 (p 139) quotes that 'William Tylesworth' was in fact burnt in 1506, and that Thomas Bernard and James Morden (a labourer), were burnt about two years later. Amersham Golf Club (now defunct) was founded in 1897. The club continued until the onset of the First World War. The area of the town now known as Amersham on the Hill was referred to as Amersham Common until after the arrival of the Metropolitan Railway in 1892. After this date growth of the new area of the town gradually accelerated, with much work being done by the architect John Kennard. It is now known locally as "Amersham-on-the-Hill", "Amersham town" or the "New Town". In 1931, the architect Amyas Connell completed the Grade II listed art deco house, "High and Over" in Amersham. It has been used as a film location. Amersham sent two MPs to the unreformed House of Commons from 1625, and was considered a rotten borough until the Reform Act 1832 stripped it of its representation. The town was then part of the county constituency of Buckinghamshire. 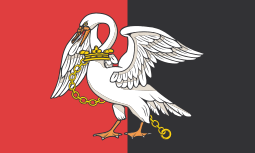 From 1885 it was in the Aylesbury constituency, in 1950 it formed part of the South Buckinghamshire seat and in 1974 the current Chesham and Amersham constituency was created. Since then Ian Gilmour (1974–1992) and then Cheryl Gillan have represented the constituency on behalf of the Conservative party. In the 2005 General Election Ms Gillan was returned with 54.4% of the vote. At local level, Amersham is represented by its own town council. It is a civil parish within Chiltern district. It comprises the following district council wards: Amersham Town; Amersham Common; Amersham-on-the-Hill; Chesham Bois and Weedon Hill. Amersham is represented by two members elected for the Amersham division on Buckinghamshire County Council. Amersham is located at 51°40′00″N 00°38′00″W﻿ / ﻿51.66667°N 0.63333°W﻿ / 51.66667; -0.63333 (51.6667, −0.6333). Old Amersham is situated on the valley floor of the River Misbourne. This is a chalk stream which dries up periodically. The river occupies a valley much larger than it is possible for a river the size of the present River Misbourne to cut, making it a misfit stream. The valley floor is at around 100m OD, while the valley top is at around 165m OD. It is likely that the valley was formed under conditions akin to those required to form a dry valley. Amersham on the Hill is built on the north side of the Misbourne valley, on a small plateau that forms the watershed between the Misbourne and the neighbouring River Chess. Amersham is linked to London by the Metropolitan line of London Underground and is the last station on the Metropolitan main line. Much of this line is shared with the mainline railway service, which runs from Marylebone to Aylesbury. Before electification of the line, the Metropolitan Line ran via Aylesbury to Verney Junction and Brill. London Transport eventually abandoned plans to electrify the line north of Amersham and the stations and line were sold off to British Railways on 11 September 1961, turning Amersham into a terminus for the Metropolitan Line. To this day, these Chiltern Railways stations display a characteristic Metropolitan Line architecture. The town features in the 1973 John Betjeman documentary Metro-land about the growth of suburban London in the 20th century. The construction of the railway line was controversial at the time and objections from local landowners prevented its construction until 1892. The station was built a mile to the north of the old market town and has provided the focus of Amersham on the Hill ever since. Chiltern Railways share the railway track with London Underground and run services from Marylebone to Aylesbury Vale Parkway that pass through Amersham every day. In March 2010, the Government announced the preferred route of the proposed High Speed Railway, HS2, non-stop from London to Birmingham. A campaign of opposition to the impact on the town and the surrounding area of the preferred route is being locally co-ordinated by a protest group, Amersham Action Group, which along with other protest groups is part of the HS2 Action Alliance. The route was confirmed by the new government in January 2012. 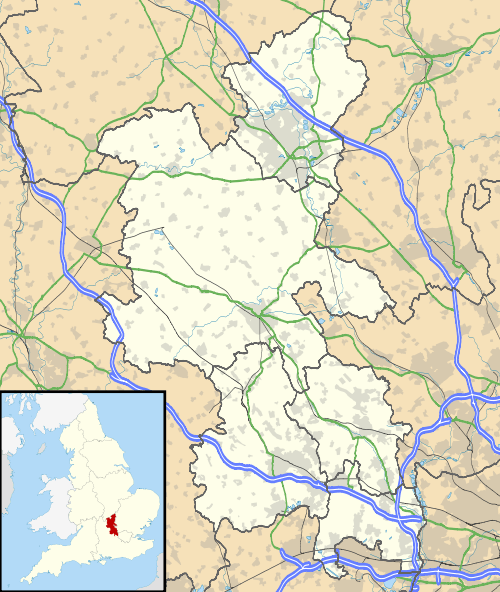 The town is located at the junction of the A355 road from Slough and Beaconsfield, the A404 road that links Maidenhead, High Wycombe and Harrow, the A416 road from Chesham and Berkhamsted and the A413 road, which runs from Aylesbury to Uxbridge. Packaging radioactive pharmaceuticals at GE Healthcare's facility. Early trade at Amersham Market was in local grain, much of which was sold to London merchants. During the 17th century and 18th century a key industry in the town was brewing. After a number of changes of hands during this time William Weller of High Wycombe purchased the brewery in 1775. He, and his heirs, expanded the business by buying a number of local public houses during the next 150 years. In 1929 Gerrard Weller sold the brewery and 133 tied public houses to Benskins of Watford for £360,000, a move that led to the end of brewing in Amersham. In addition to brewing, tanning, lace manufacture and brickmaking all had a prominent place in the manufacturing past of the town. During the Second World War, the Radiochemical Centre, a scientific research establishment, arrived in the town. This became Amersham International, then Amersham plc, and now, after a number of changes of ownership and name, is part of GE Healthcare. Another major company, Halma, which specialises in hazard and life protection products is headquartered in Old Amersham. It is a member of the FTSE 250 index. Amersham on the Hill has a free church which is United Reformed and Baptist, the Methodist church St. John's and the Church of England St Michael & All Angels. Old Amersham includes the Church of England St Mary's Church (a Grade I listed building since December 1958), the exterior is largely Victorian but it includes 17th century glass from Lamer Manor in Hertfordshire, a 14th-century font, and monuments in the chancel and in the Drake Chapel to 17th and 18th century notables. Also in the town there is also a Quaker meeting house, a Methodist church and the King's Church, a Baptist church. There was also an Exclusive Brethren Meeting House. There are two secondary schools located in Amersham; Dr Challoner's Grammar School a grammar school for boys and the Amersham School a secondary modern school (more usually referred to as a community school). Additionally, Amersham is included in the catchment areas of both Dr Challoner's High School, a girls' grammar school in Little Chalfont, and Chesham Grammar School, a co-educational grammar school in Chesham. The Dr Challoner's schools share a common foundation dating back to 1624 when the grammar school (then for boys only) started in Old Amersham. Dr Challoner's Grammar School moved to its present site in Amersham-on-the-Hill in 1905 when it became co-educational. In 1937 the school was incorporated into the state system. After rapid growth it was decided to establish Dr Challoner's High School for Girls in nearby Little Chalfont in 1962 and Dr Challoner's Grammar School reverted to being for boys only. In 2015 Dr Challoner's Grammar School once again welcomed girls into its Sixth Form. Amersham School opened on its current site in 1964 as the Brudenell County Secondary School (for girls). Following the closure of the Raans County Secondary School (for boys) in 1992, Brudenell became co-educational and was renamed Amersham School. Amersham is served by several primary schools, including Our Lady's Roman Catholic Primary, Chestnut Lane School, Elangeni School, Chesham Bois Church of England School, St. Mary's Church of England Primary School, St. George's Church of England Infant School and Woodside Junior School. There are two private preparatory schools: The Beacon School (boys) and Heatherton House (girls). Amersham is also served by Amersham & Wycombe College for further education. Amersham has a King George's Field in memorial to King George V. Near the playing field is the "Chiltern Pools", one of the five venues used by the Amersham Swimming Club. The Chiltern Pools complex also contains the Climb, an indoor climbing wall, unique to the region. Chiltern Pools consists of three swimming pools, including a 25-metre main pool, a fun poolwith three water slides and a diving pool with a moveable floor to allow all ages to progress in swimming ability. Chiltern Pools also includes a large gym facility with cardiovascular and weights equipment. Since 2007 a third generation muga with synthetic grass allows all year play. Amersham Town F.C. play football at Spratley's Meadow in Old Amersham, while various football teams use council facilities at Hervines Park (Amersham on the Hill) and Barn Meadow (Old Amersham). Situated also at the Barn Meadow site, (School Lane, Old Amersham) is the 61 Judo Club, a family-oriented, successful and competitive judo club catering for serious and social players alike. It has currently (2011) over 80 active members, and has provided several members of recent British Junior, Senior and Masters squads. Hervines Park and Barn Meadow host some cricket in the summer, but the main cricket clubs in the town are Amersham Cricket Club who play in the grounds of Shardeloes and Amersham Hill Cricket Club. Amersham and Chiltern Rugby Football Club play rugby union at Weedon Lane in Amersham on the Hill. The Chiltern Harriers Athletics Club is the local athletics club. Amersham and Chalfont Hockey Club is the local hockey club based at Buckinghamshire New University. Terry Pratchett & Neil Gaiman "Good Omens" (briefly – Pratchett grew up in nearby Beaconsfield). Bill Pertwee, born in Amersham, best known as Warden Hodges in popular sitcom Dad's Army. Alastair Leithead, born in Amersham, journalist working as a foreign correspondent for the BBC. 1 2 Hunt, J (2001). A History of Amersham. Phillimore. ISBN 1-86077-187-4. ↑ But see:S. McSheffrey Gender and heresy: women and men in Lollard communities, 1420–1530,(University of Pennsylvania Press, 1995), pp.97,215. ↑ “Amersham Golf Club”, "Golf's Missing Links". ↑ "High & Over, Amersham". ↑ Coppock, JT (1962). The Chilterns. The Geographical Association. ↑ Amersham Swimming Club Archived 27 December 2013 at the Wayback Machine. ↑ Shalam, Sally (13 March 2010). "The Crown, Amersham, Buckinghamshire". The Guardian. Retrieved 2 January 2012. ↑ Midsomer Murders Locations Retrieved on 6 March 2007. Archived 25 October 2009. ↑ Dessau, Bruce (19 October 2007). "Is Katy Brand the new Catherine Tate?". London Evening Standard. Retrieved 26 April 2012. ↑ "Giles Cooper – official Royal Variety Biog". ↑ Hay, Malcolm (25 September 2006). "Paul Foot: Interview". Time Out London. Time Out Group. Retrieved 28 June 2016. ↑ Geldard, Suzanne (24 May 2011). "The Eddie Howe story: Part two". Lancashire Telegraph. Retrieved 26 April 2012. ↑ Stanley, Richard (30 October 2004). "Pan's people". The Guardian. Retrieved 26 April 2012. ↑ "Obituary: Jennifer Worth". The Daily Telegraph. 29 July 2011. Retrieved 26 April 2012. 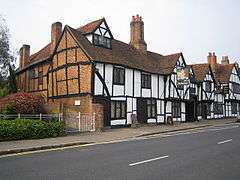 Wikivoyage has a travel guide for Amersham. Wikimedia Commons has media related to Amersham.